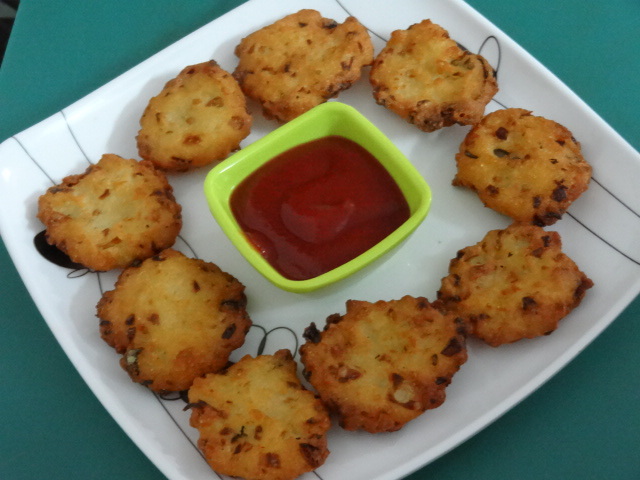 A simple evening/teatime snack, vadas are extremely popular across India, especially South India, where it is often served with different varieties of chutney. 1. Soak 1 tblsp of dal in water for 15 to 30 minutes. 2. Fry the remaining 1 tblsp dal till golden and grind to a powder. 3. Combine and grind the peppercorns and cumin seeds to a coarse powder. 4. Combine the rava, urad dal, salt, asafoetida powder, cumin peppercorn powder and ghee in a bowl. 5. Add the ground dal powder and enough water. 6. Mix well and keep aside for 45 minutes. 7. Add curry leaves and mix well again. 8. Take a small ball of the dough and lightly dip them in rice flour. 9. Roll it into small puris. 11. Fry the vadas till light golden brown and remove. Feel free to comment or share your thoughts on this Rava Vada Recipe from Awesome Cuisine.